Try not to get your hopes up though, because these ancient beasts will not be starring in the next Star Wars film. However, they do join a vibrant new field of research on the pigmentation and coloration of long-extinct animals. New exquisitely preserved fossils of a turtle, mosasaur, and ichthyosaur provide evidence that these ocean dwellers all separately evolved dark skin coloration.These results represent the first definitive traces of pigments in reptiles outside of the evidence of pigments found in dinosaur feathers. From top to bottom: leatherback turtle, ichthyosaur, mosasaur. Image courtesy of Stefan Sølberg. The research, published January 8 in Nature, analyzes a fossil of a 55 million year old ancestor of the leatherback turtle that possesses fossilized skin. The publication also describes similar remains of an 86 million year old mosasaur, an aquatic reptile that looked like an large monitor lizard, and a 190 million year old ichthyosaur, an aquatic reptile that resembled modern dolphins and other whales. By using high-powered microscopy, Johan Lindgren of Lund University in Sweden and his colleagues discovered small sausage-shaped structures in the skin of the turtle specimen. Similar structures have previously been explained as organelles or bacteria. However, Lindgren believed they were melanosomes, structures that contain a dark pigment called melanin. By analyzing the chemical composition of the surface of the fossil using ion mass spectroscopy, the scientists were able to confirm the presence of considerable amounts of eumelanin, a pigment that is also responsible for skin color in humans. “The method is pretty fast and minimally destructive,” Jakob Vinther of Bristol University told The Scientist. Additional analyses were performed to reject the possibility of these structures being bacteria or phaeomelanin, another type of melanin that often produces red or yellow pigmentation. 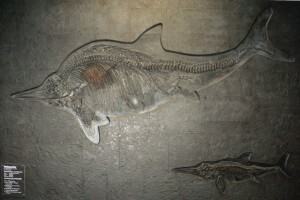 A fossil specimen of an adult and juvenile Stenopterygius quadriscissus, an ichthyosaur species. Image courtesy of Alex Giltjes. 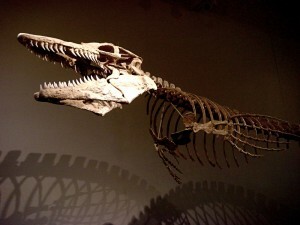 A fossil specimen of Tylosaurus, a mosasaur species. Image courtesy of Marc Banks. 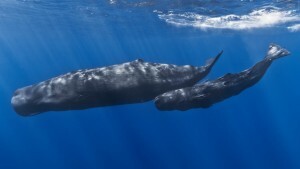 A mother and juvenile sperm whale, examples of the rare occurrence of modern animals with uniform dark coloration. The dark pigmentation would provide a non-reflective surface which may allow the animal to blend into low-light environments. Image courtesy of Réunion Underwater Photography. 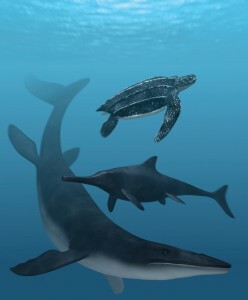 Based on the widespread nature of the melanosomes and the high density of the structures, the authors concluded that these marine reptiles shared a similar coloration to that of the modern leatherback turtle, which has an almost entirely black shell. “You don’t see that in many animals today, except for the sperm whale,” Lindgren told The Scientist about the uniformly dark pigmentation of these reptiles. He suggests that, like sperm whales, these reptiles may have been deep-divers. Additionally, the authors propose that the pigmentation may have played a role in regulation of body temperature, UV protection, and crypsis, or the act of camouflage. The former may have permitted them to live in colder environments by allowing for them to absorb more of the sun’s heat through their skin. The convergence of these very similar pigmentations in these distantly related animals provides evidence for the importance of melanin in the evolution of these animals. By further studying their coloration, scientists may also be able learn how they behaved, even such a long time ago.